Knitting machine Knit 2 Fashion accessories Includes:1 Machine 2 Th.. This kit contains:50 colorful Origami paper, 14*14 cm. Step-By-Step Bilingual Guidebook for.. This kit contain all the needed tools and materials that help you to decorate you Christmas Tree wit..
Floral fans can create their own special spot for storing treasures with this craft kit. Includes a .. Creating the perfect patchwork pal has never been so fun, fast, and easy! pre-cut round stickers in ..
Abracadabra! This fantastic wooden set includes four easy-to-master tricks for beginners. Young magi..
Set the perfect table for your play-food feasts and pretend parties! This sturdy play set comes with.. Toddlers will be fascinated and preschoolers will be inspired by this amazing color-matching and cre.. Designed for hours of play and ideal for travel, this wooden magnetic board includes 120 colorful ge..
Glossies are wristbands made from custom paints. Young fashionistas can mix and swirl the paints to ..
A real working foot spa, this is the ultimate pedicure experience for your little one! 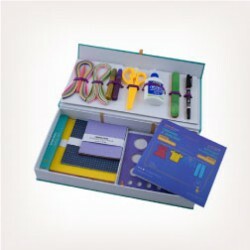 Includes a c..
Includes 17+ tools: (Quilling tool pen, Sizer, Glue, Glitter pen, Pen, Scissor, Tongs, Yarn, Wo..
Includes 17+ tools: (Quilling tool pen, Sizer, Glue, Glitter pen*2, Pen, Scissor, Yarn, Clips, Foam..
A new twist on friendship bracelets Awesome retro threads create super cool bracelets Add fashion ..
Creative Magic Color N Glow - TMNT B913565 Create glowing 3D images that jump off the screen!With t..